BELLEVUE – A packed room gave the Erie County commissioners a standing ovation Tuesday when they voted to deny the payment in lieu of taxes (PILOT) for a wind farm project. 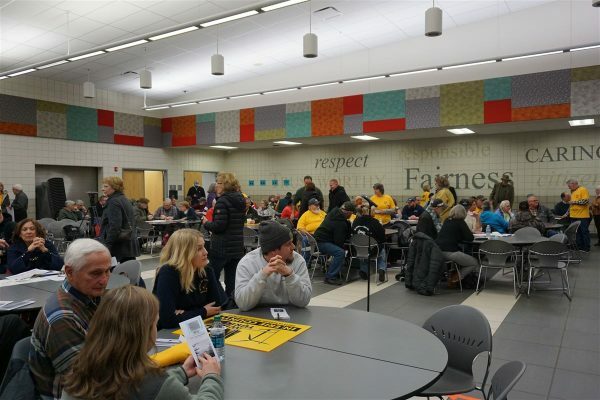 The commissioners hosted a public hearing at Bellevue Elementary School with the trustees of Groton and Oxford townships to hear from the public on the Emerson Creek Wind Project. The project, which is developed by Apex Clean Energy, would see the construction of up to 71 wind turbines in Erie and Huron counties if approved by the Ohio Power Siting Board. Apex gave a presentation on what it believed would be the benefits of the project and pointed out that the county only had power over how the money would be received. 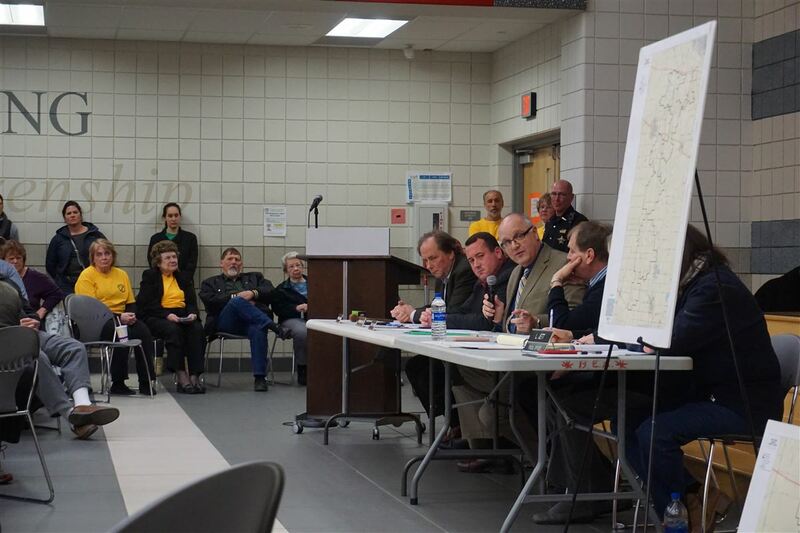 The approval for the project is in the hands of the Ohio Power Siting Board. 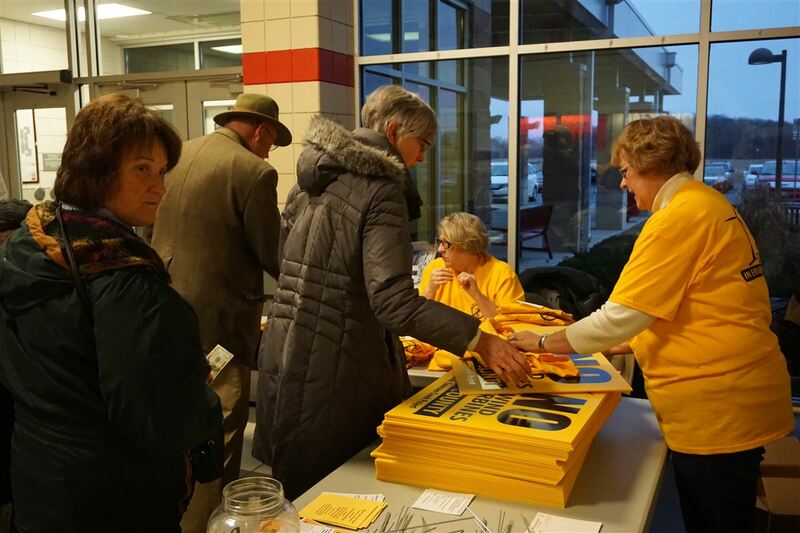 Hundreds of people filled the cafeteria many of whom, like Oxford Township resident Krista Beck, wore yellow shirts signifying their disapproval. Beck believes wind energy is too ineffective and the life span too short. Others aired concerns on possible problems of putting impermeable concrete foundation near groundwater in Bellevue. Another complaint was the violation of land rights and the aesthetics of turbines. One of the few people to speak in support of the project was Bill Dillion, of Milan, who spoke about the need to explore alternative energy and cut down emissions. “There’s a point when we have to start doing better with our environment. There are so many things that are changing. 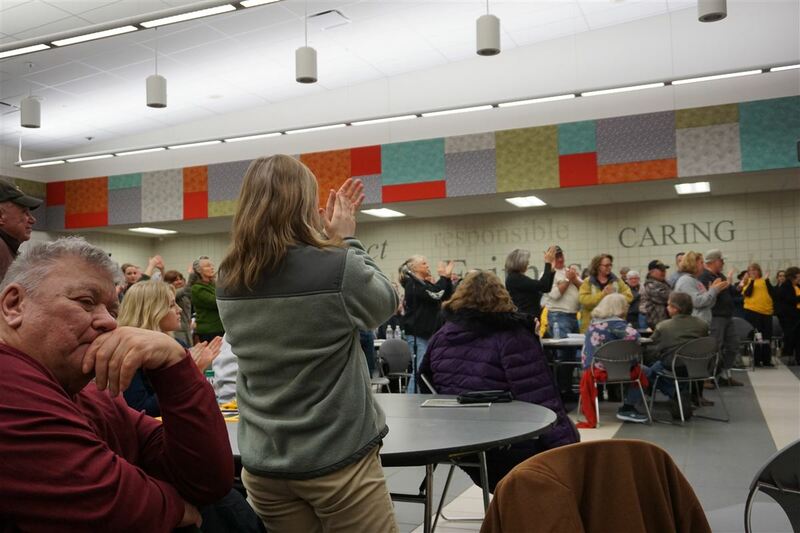 I tried to find nonpartisan information and its tough to do because the people who stand to lose the most are fossil fuel companies,” Dillion said. But the only issue the commissioners could vote on was whether to accept the payment in lieu of taxes or to deny it and receive property taxes from the turbines if the project is approved by the siting board. “It almost seems better to not do the PILOT … I’m not really sure where the advantage is to it,” commissioner Pat Shenigo said. Commissioner Matt Old agreed that he didn’t see the advantage to the payment progam and said it would be better to receive the $1.3 million upfront through real estate tax. 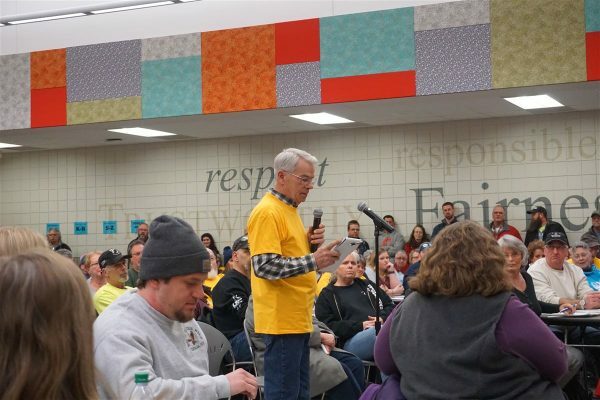 “I think I’d prefer to have my money upfront if the project really is a go and we don’t have a say in it … we just have a say in how we want the money and my opinion is we want the money upfront,” Old said. Steve Shoffner agreed with his fellow commissioners and said his perspective going into this was figuring out what the residents wanted for themselves. The commissioners had 30 days from the submission of the payment in lieu of taxes, otherwise known as the PILOT, but decide vote at the public hearing with all three voting against it. But Emerson Creek’s project developer Sarah Moser said the project will move forward without the PILOT.